Custom sportfish builder and yacht service professionals Jarrett Bay Boatworks were recognized for their accomplishments through the first annual Refit Excellence Awards presented January 28, 2016, at Refit International Exhibition & Conference in Ft. Lauderdale, Florida. Jarrett Bay Boatworks received this prestigious award for their refit of custom hull 25, Starflite. Winning a Refit Excellence Award involves a process of submissions and nominations that concludes with an independent panel of judges selecting the winners based on not only the finished yacht but on the teamwork, problem-solving and efficiency of everyone involved in the refit; including the boatyard, captain, owner, designer, surveyor and management. The awards ceremony was held during the Refit show at the Broward County Convention Center and was emceed by Kitty McGowan of the U.S. Superyacht Association. 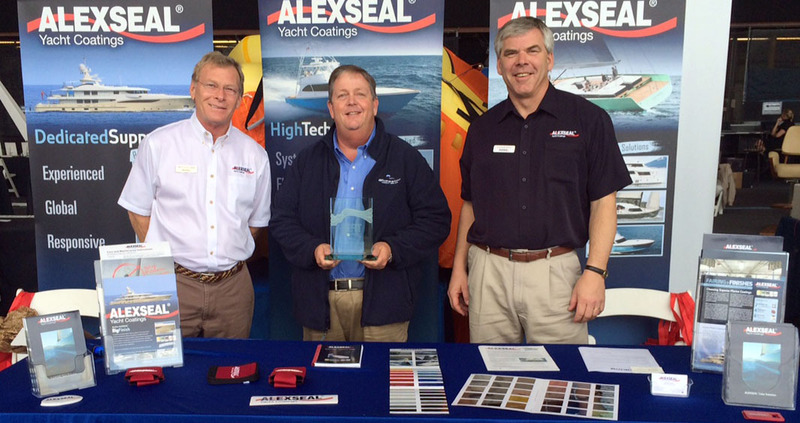 Jarrett Bay President and Starflite owner, Randy Ramsey received his award with Alexseal Yacht Coatings representatives Jeff Holland and Alastair Smith. Starflite is a 54-foot custom sportfisherman built in 1999. Owned by Jarrett Bay Boatworks’ company president, Randy Ramsey, and captained by Joey Johnson, Starflite underwent a two-year refit between April 2013 and May 2015. Jarrett Bay reconfigured Starflite‘s layout of the salon and galley and updated her kitchenette. The interior appointments were by Beth Reid with Crystal Coast Interiors and Atlantic Veneer helped with her new teak accents and soles within the interior. Custom Yacht Interiors and Design installed a new headliner throughout and IC Granite made Starflite‘s new granite countertops in the salon and galley. Starflite has new bi-color Imtra bridge lights and Aqualuma underwater lights along her transom. To complete the package, she received Alexseal hull and topside coatings and a Sea Hawk bottom paint job from Royale Yacht Coatings. Additional industry partners who helped this restoration and refit become a reality include Airmar Transducers, Bluewater Supply, Endurance/CoPoxy, Offshore Marine, Capt. Shop and Wildcat Propellers. In addition to the extensive renovations and upgrades throughout the interior and exterior, Starflite was also repowered to help boost her performance and efficiency on the water. Thanks to Jarrett Bay’s partners at Gregory Poole Caterpillar, she received the first pair of prototype twin-charged Cat C12.9 engines in North America. These inline six cylinder diesel engines have a relatively small footprint with a very impressive power rating of 1,000 hp each. The resulting size to weight ratio makes Starflite a leader out of the shoot with her impressive power density. Plus, her full GPLink Remote Monitoring and Tracking System keeps tabs on all vital systems on the engines and throughout the boat.